The development sector loves to measure — and maximize — its impact. Every penny spent is meant to reach beneficiaries, directly or indirectly. That means one of the biggest challenges is using limited resources to reach as many people as possible. How can development organizations stretch their resources? The best way is to make sure that every cent, person, and chunk of time is used optimally. This is where monitoring and evaluation comes into play. Simply put, monitoring is an ongoing process of collecting and analyzing data to check a program’s efficiency. This data is used to plan, monitor and improve programs. Continuous process: Monitoring is also called process evaluation because it is a continuous process that runs through the entire program. Usually, there is a dedicated M&E officer who handles this process. Regular data collection: Data is collected at regular intervals (monthly, bi-monthly, or quarterly, for example) using a preset questionnaire, which has metrics that are decided at the beginning of the program. Data is also collected at the beginning of the program, which serves as a baseline. Identify gaps in implementation: Monitoring data is extremely important because it helps the program make adjustments during the implementation phase. Monitoring helps identify gaps that keep the program from making maximum impact. Changes during implementation help development organizations get better results and use all their resources better. Conducting an impact assessment survey soon? Use this ready-to-use survey template and get started in just a few minutes. For example, say that a nonprofit wants to increase coverage of Hepatitis C vaccination in a village. They start a program providing free vaccinations at health centers and through door-to-door services. Evaluation would measure how many people are vaccinated before and after the program to see if coverage has increased. What if the government is simultaneously running an awareness campaign to encourage Hepatitis C vaccinations? How can the nonprofit know how much of the change in coverage is caused by their program, and how much is caused by the government’s program? This is where the control group (which isn’t covered by the nonprofit’s program) comes in. Say the control group’s coverage increases by 20% and the target group’s coverage increases by 50%. Then the nonprofit would know that the government’s program led to a 20% increase in vaccination, and their program led to a 30% increase in vaccination. Evaluation is a critical component for any program, as it allows program designers to identify gaps, strengths, best practices, and learnings that can help them improve implementation in the future. Read about the seven types of evaluations here. So what is monitoring and evaluation? As the name implies, monitoring and evaluation (M&E) is monitoring followed by evaluation. 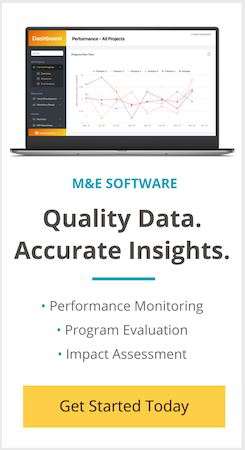 M&E involves collecting data, monitoring key indicators of a program, and evaluating whether it has met its objectives. M&E isn’t possible without a monitoring and evaluation plan. This is a document that includes the objectives of the program and the activities designed to achieve them. An M&E plan outlines the procedure that will be used to evaluate whether or not the objectives have been met. It should include the data that will be collected, the method of collection and analysis, how the data will be used, and the resources that will be required to implement this plan. The whole M&E plan must be aligned to the overall goals of the project. For example, if the program goal is to increase the number of school-going children in a district of Uttar Pradesh, India, every element of the M&E plan will be designed with this objective in mind. A M&E plan is most effective when it is designed at the beginning of the program. This helps scope and allocate the required resources right at the start. However, the plan should be an ever-evolving process, and it should be revised if there are changes to the program during evaluation. Helps an organization make informed decisions about their program based on evidence. Identifies ways to use resources more effectively and efficiently. Helps identify the impact of the program, gaps in implementation, and things that worked successfully. Provides data that can help convince donors to invest more or help program officers devise alternative approaches to address their problems. It is very important to update the M&E plan as and when there are changes in the program that affect the original plans. Here’s how you can develop an effective M&E framework. The results of a M&E exercise are useful for stakeholders at different levels. For program managers, M&E can help improve how a program is implemented. For donors and funders, M&E can help them plan future programs. For governments, it can help inform policy by showing what programs work or don’t work. If your M&E plan isn’t working, read here to learn about 5 things you could be doing wrong. In conclusion, a robust M&E program is a long-term tool that can help improve the implementation of ongoing programs as well as help inform decisions on new programs. By revealing critical implementation gaps, M&E plans help make programs more effective. This means that each round of M&E helps organizations reach more people and make even greater impact. good one, however a pdf would be better to enable printing. this is very informative, if you share the complete documents with us in PDF. its really very impressive and informative . i will be highly obliged to share with me on Email. Highly interested in piece. It will be great achievement to provide the comprehensive guide in PDF and share with M&E’s Programmers it will help. Share this in PDF while you work on full details please. So glad to hear that. More great content coming your way! Extreamely nice to have the full document of the above details if you share with us. Thanks for the suggestion. We are working on more formats for sharing these resources and will share it with you soon.